Captain Ben Wolfe with Sport benFish Michigan gives his report for the Michigan area waters during late June 2016. 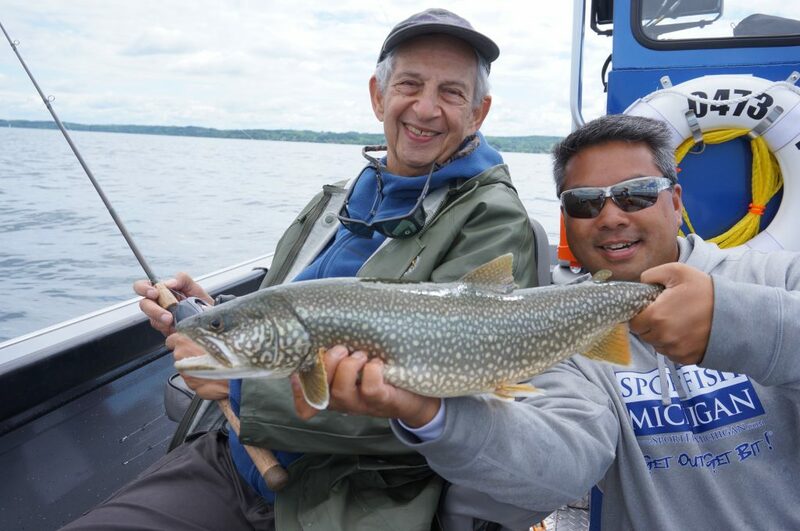 June is a great time to get out on the Grand Traverse Bays and Platte Bay to target lake trout, whitefish, and cisco (or lake herring). Typically these three species spend most of the year in water deeper than 90 ft. With the waters in the bays reaching that magical 50-degree mark, the baitfish will begin to congregate in that 40-50ft range, and will stay there through most of the month. Ciscos were the first to load up and become active on the drop offs and flats of each bay, and fishing was absolutely phenomenal in May. Anglers can catch ciscos using standard vertical jigging techniques with presentations such as Swedish Pimples, S-Jigs, Jonah Jigs and Squirrel Jigs. If anglers would like to try casting in the shallows, gold or silver colored blade baits have been working very effectively when worked in a yo-yo fashion close to the bottom. In June, the white fish can be found in the same areas as ciscos using the same techniques. That is the best thing about fishing in June; you never know what is going to attack your bait next! As the water approaches the mid 50’s the lake trout population will begin to become very active, showing up in large schools mainly in depths from 30-60ft. Some trout may even venture much shallower, being caught in water as skinny as 2-3 feet! This is a very exciting depth for all different techniques and anglers. Anglers will have great success casting and jigging with light action rods using fluorocarbon leaders and use the baits for cisco and whitefish mentioned earlier in the report for targeting hungry trout, with the addition of crankbaits or weighted streamers for those casting the super skinny water. For those anglers that are more into the trolling game, here are a few helpful tips. Fishing shorter lead cores from 3-8 colors with fluorocarbon leaders will be a must. Smaller spoon presentations will also be very helpful, such as Stinger, Warrior, and Silver Streak brands. This style spoon should be presented using slide divers dialed to a 2.0-3.0 angled setting. Most slide divers should be rigged with nothing less than a 60ft fluorocarbon leader. Anglers will find that slide divers can be the only thing going for them in a shallow water situation and are a very effective tool for this specific application. June looks like it will be an excellent month to get out on the water with friends and family to take advantage of some spectacular fishing opportunities. As always, be safe and we hope to see you on the water.